The SELECT program offers a wide variety of dining tables to easily match with any size, type, and style of dining area. This contemporary gathering height table features sleek tapered legs for a shaker-style look. One 18" leaf extends table length to 54" for a large square size. Solid rubberwood construction ensures sturdy, long-lasting support. Floor to apron height is 32.25 inches. 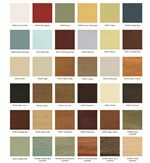 Available in 36 paints and stains, as well as specialty aged finishes. The SELECT Dining Butterfly Leaf Gathering Table with Shaker Legs by John Thomas at Furniture Barn in the Pennsville, Bear, Newark, Hockessin, Middletown, New Castle, Townsend, Talleyville, Wilmington, Marshallton, Smyrna, Elkton, area. Product availability may vary. Contact us for the most current availability on this product.